Intel shows off Rose Point, a new research project that integrates WiFi on the die of an Atom SoC. The project means we're getting one step closer to a chip that integrated CPU, GPU, I/O, and WiFi into a single package. One issue with a processor that integrates WiFi is electromagnetic interference, therefore the chip giant is working on new miniature shielding methods and noise-cancelling technology to counter corruption issues. Full details at DailyTech. As they say, every rose has its thorns, and Rose Point was no exception. Part of the difficulties with the new SoC were inherent -- due to the fact that traditional modem designs incorporate a slew of analog circuit components, such as synthesizers and amplifiers. These components allow wireless modems to operating on a large range of device voltages, but they also mean that Intel had a heavy redesign on its hands, in crafting its revised silicon modem, which used only two voltages. And that wasn't the only thorny issue with Rose Point. Electromagnetic frequency (EMF) interference also proved a key stumbling block for electronics giant. 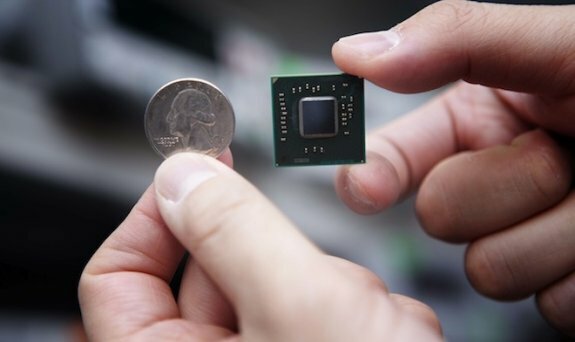 As the speed of Wi-Fi communications (2.4 GHz) is close to Atom's base CPU's base clock speed, the two portions of the chip would interfere with each other, leading to corruption issues. Hossein Alavi, director of Intel’s Radio Integration Lab, describes in an interview with Wired, "This radiation seeps into the RF module and corrupts the data. The closer they are, the more interference is going to go to them."